The Ganged Phased Array Radar - Risk Mitigation System (GPAR-RMS) research project goal is to aid in the integration of unmanned aircraft (UA) operations into the United States national airspace system (NAS). The number one challenge that limits UA operations in the NAS is the lack of a pilot onboard the aircraft to perform the "see and avoid" function required by the regulations that govern NAS use. "See and Avoid" simply means watching for other aircraft and avoiding colliding with them. 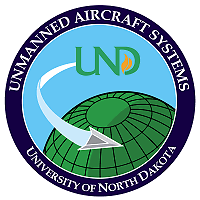 Personnel within the Center for Unmanned Aircraft Systems Research, Education, and Training at the University of North Dakota have been pursuing a two-pronged approach to meeting this challenge. These involve sensing aircraft using ground-based radars, combining that information with those from cooperative aircraft reports, and providing the required information to UA pilots [the Ganged Phased Array Radar-Risk Mitigation System (GPAR-RMS) which is a form of Ground Based Sense and Avoid (GBSAA)]. The other approach is to use sensors onboard UA to identify and avoid other aircraft [Airborne Sense and Avoid (ABSAA)]. The GPAR-RMS concept uses three phased array radars stationed in a triangle to monitor an operational airspace simultaneously. The use of three radars increases system redundancy (which increases safety), probability of target detection, and target classification. Other systems used with the GPAR-RMS include ADS-B, GPS, and transponders. The combination of all these sensor data provide the pilot with a true air picture of all the targets that are a possible risk to UA operations. This system has been developed and deployed several times with the ScanEagle system. A 40 ft fifth-wheel trailer was acquired for use as an operations center for both the GPAR-RMS and the ScanEagle GCS. Although the GPAR-RMS is still in a testing phase, it has proved to be extremely valuable during these deployments. Deployed the GPAR-RMS with the Telemaster UAS for Atmospheric Science payload testing flights at Camp Grafton South. Successfully integrated live radar data into the GPAR-RMS during a Dual Bay ScanEagle flight near Oslo, MN. First flight of the Dual-Bay ScanEagle near Oslo, MN. The radar truck was also fully utilized for the first time as it carried the ScanEagle launcher, radar, and other equipment for the deployment. Deployment of CropCam and GPAR-RMS at Flying S Ranch to test changes with Micropilot Horizons GCS integration efforts. Radar truck is repaired and back at UND. ScanEagle and GPAR-RMS to test the GPAR-RMS along with continued flood monitoring near Oslo, MN, and DSCA efforts. ScanEagle and GPAR-RMS deployed to test GPAR-RMS equipment, software, and concepts along with continued flood monitoring near Oslo, MN. Successful live video streaming to an off-site webserver was also accomplished during this deployment. Fully integrated GPAR-RMS software system into the Command and Control Center deployed with the ScanEagle. Also performing flood monitoring near Oslo, MN, and providing DSCA. Test integration of Micropilot Horizon GCS into the GPAR-RMS using the CropCam UAS at Flying S Ranch. ScanEagle deployment near Oslo, MN, with first test of integrated GPAR-RMS software system. Also deployed was the newly acquired radar truck. ScanEagle deployment for post-flood observations near Oslo, MN. ScanEagle deployment for continued flood monitoring near Oslo, MN. First ScanEagle deployment near Oslo, MN, to monitor flooding conditions in support of Defense Support of Civil Authorities (DSCA). Last Update: 11/20/2015 Comment on this page.